Posted by Hillary Zhang on 4/13/2019 11:20:54 AM. The publishing industry has seen a significant boost in sales with the release of eBooks and audiobooks. As audiobooks have become a booming market, especially Audible books, people now are able to listen while they’re on the go. eBooks are huge as well, as people can download and store any book on their eBook reader and read from anywhere. Since PocketBook Reader allows you to listen to audiobooks or music while reading, it’s very necessary to show you how to listen to Audible books on PocketBook Reader. If you are also interested in reading eBooks on PocketBook Reader, you can read this guide about how to read eBooks on PocketBook Reader. 1. Does PocketBook Reader Support Audio Files? 2. 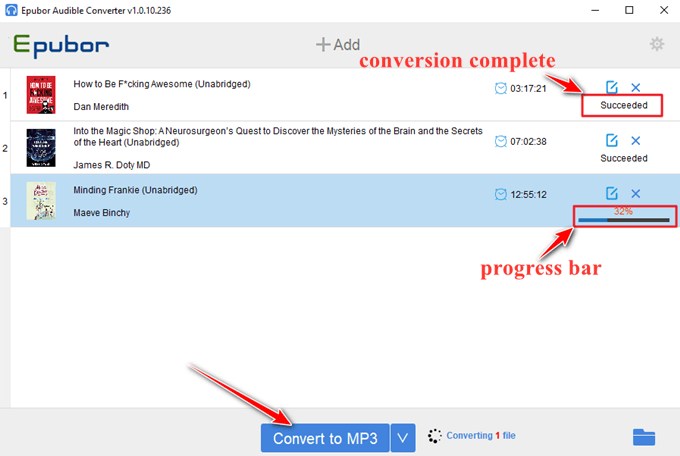 How to Convert Audible Books to MP3? Luckily, both PocketBook InkPad 3 and PocketBook Touch HD 2 support MP3 format via micro USB adapter. Integrated audio features offer opportunities to listen to audio books or to enjoy music while reading. These two PocketBook Readers were definitely created to bring absolute comfort and excellent user experience for those, who are in love with reading as well as listening to audiobooks. By the way, the brand new InkPad 3 might just be the best e-reader that Pocketbook has ever produced. The extra large screen and new warm light illumination system really makes it a compelling value proposition. It looks like Pocketbook is trying to seriously compete against the Kobo Aura One and Tolino Epos. Epubor software is a professional company dedicated to get rid of DRM protection in order to help you liberate your purchased Audible books and Kindle/Kobo/Google Play Books. And its Epubor Audible Converter software can 100% convert Audible Books to MP3/M4B in the fast speed. Step 1: Install Epubor Audible Converter to your computer. Step 2: Add Audible AA/AAX Files to Epubor Audible Converter. Just click Add to upload Audible books to Epubor Audible Converter. If you don’t know how to download Audible books from Audible website, you can follow this simple step-by-step guide. Tips: Epubor Audible Converter can detect your downloaded Audible books automatically. All you need to do is click the Add button and select the books. Or you can directly drag and drop AA/AAX files to the main window of Epubor Audible Converter. Click Convert to MP3 button to start the conversion. 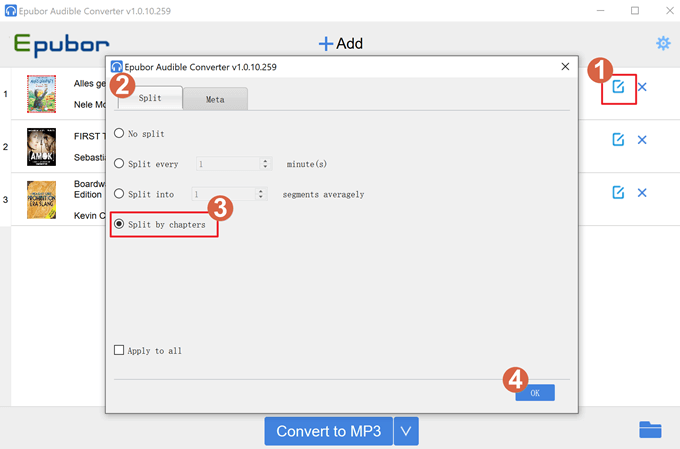 When Epubor Audible Converter successfully converts Audible files to MP3, a pop-up window will contain the MP3 files. 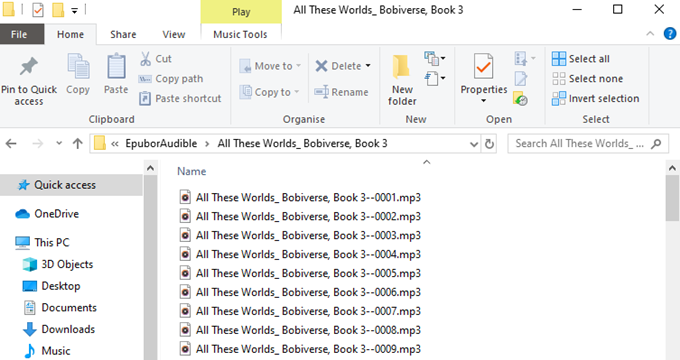 If you want to get the converted MP3 files saved in separated chapters, you need to click the Edit button and choose Split by Chapters function after adding Audible books to the software. Then click the Convert button. Epubor Audible Converter also supports split Audible files by average segments and fixed length of time. Then you will get the converted MP3 files in separated chapters after the successful conversion. If you encountered any problem with Epubor software, feel free to contact their customer support to get the professional help by sending them an email(support@epubor.com) or starting a chat on Skype(epubor.alice@gmail.com). Plugging your PocketBook InkPad 3 or PocketBook Touch HD 2 to your computer via USB, then copy the DRM free MP3 files to your device. We have to admit that audiobooks and eBooks are the future of publishing. And now you can immerse yourself in listening to Audible books and reading eBooks on your PocketBook Reader. More importantly, you know how to make full use of your PocketBook Reader from now on.